Prioritise traffic in an attempt to optimise the client machines network experience (make web browsing more responsive). Traffic shaping is used to optimise or guarantee performance, improve latency, and/or increase usable bandwidth for some kinds of packets by delaying others. For more details have a look at this Traffic Shaping Wikipedia article. Before you can implement traffic shaping the Upload and Download connection speeds to the ISP must be known. From interrogating the modem for this network the Upstream Line Rate was found to be 1020 Kbps and a Downstream 19999 Kbps. Be careful using line rates in your traffic shaping rules as they most likely don’t account for L1/L2 and TCP/IP overheads (approximately 20% for ADSL). It’s also a good idea to check the connection speed from your network to the ISP, most ISPs will have a speed check utility. Traffic shaping requires pfSense to drop packets, so it's very important not to set the upper limits higher than they actually are. If pfSense is not dropping packets then they will be dropped by the ISP and no local shaping will occur. The easiest way to get started is to use one of the Traffic Shaper Wizards. Navigate to Firewall - Traffic Shaper and select Wizards. Open the Multiple Lan/Wan wizard. Set one WAN port and one LAN port then select Next. 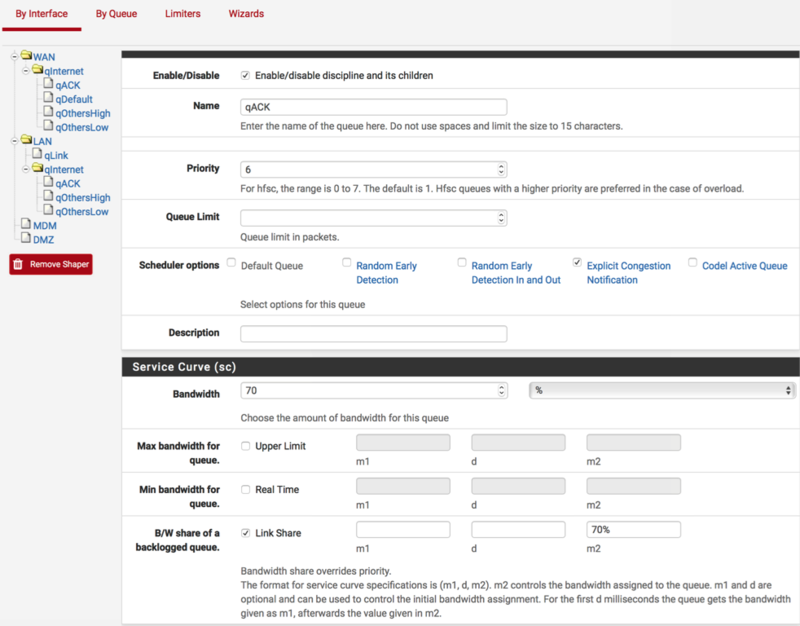 Select HFSC for both interfaces. Enter the Upload and Download speeds for your ISP connection and select Next. Select Next for the following page (unless you use any of these service). Select Enable on the Raise or lower other Applications page. FaceTime - Higher priority (if you use Apple FaceTime). Leave everything else as Default priority. These settings should give client machines a better browsing experience and set e-mail to lesser priority to “work in the back ground”. At this point there will have been some Floating Firewall Rules created and some Traffic Shaper Queues assigned to the LAN and WAN interfaces. To see the Firewall Rules navigate to Firewall - Rules and select the Floating tab. 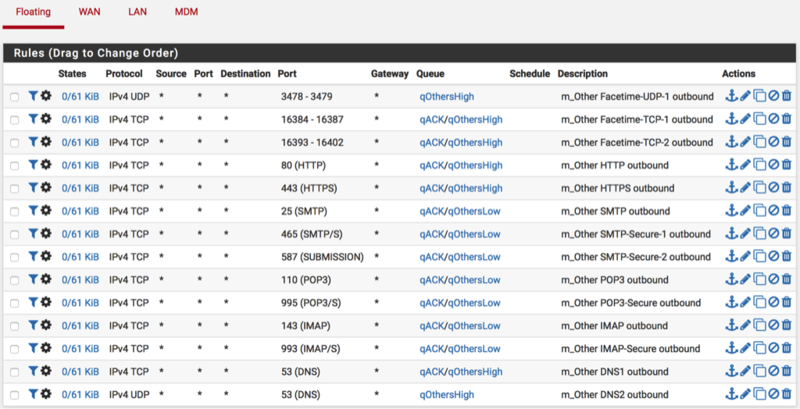 To see the Queues navigate to Firewall - Traffic Shaper. To monitor the traffic shaper queue status navigate to Status - Queues. 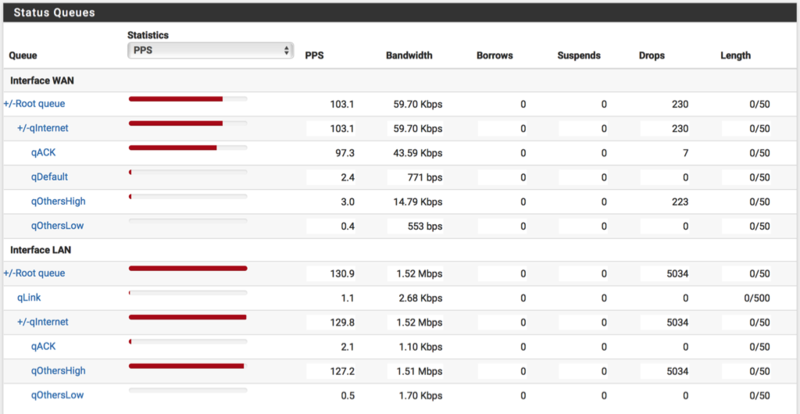 Due to the huge difference between the Upstream and Downstream speeds some tweaking is called for. 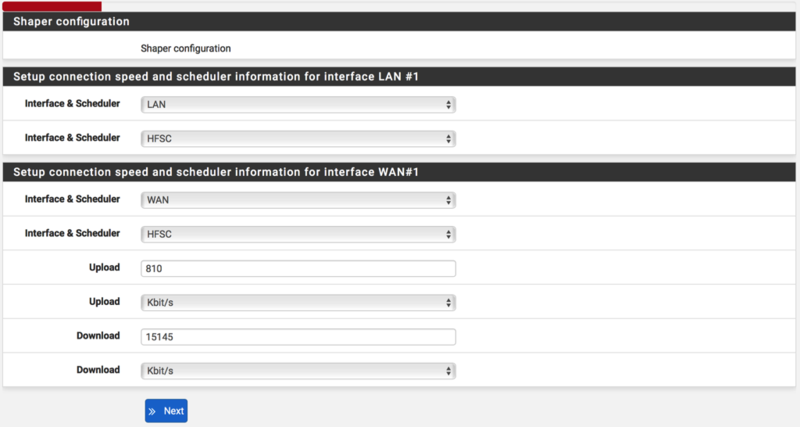 Navigate to Firewall - Traffic Shaper then select WAN. Change the Bandwidth to 100 Mbits/s. Leave ‘qInternet’ as it is at 810 Kbit/s as that matches the measured Upstream value from “Know Your Connection Speed” above. Change the Bandwidth and B/W share to 70%. Leave all ‘qDefault’, “qOthersHigh’ and ‘qOthersLow’ as the default values set by the wizard. Navigate to Firewall - Traffic Shaper then select LAN. Change the Bandwidth to 1 Gbits/s.